Make functional sales practically reachable, do more for less, improve your customer centricity, uncomplicate the process of developing and time to market a product. Our web application development services are designed to help you serve your customers the way you always wanted to, but you didn’t because you required professional assistance. 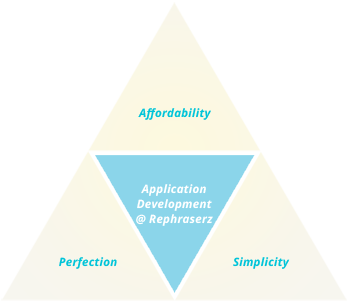 Rephraserz is a professional media and communication services agency, with an honest aim to help customers worldwide reach their business objectives. Since the launch of our flagship translation, voiceover and narration service, we have helped brands reach valued customers by uncomplicating the process of customer centricity. We have helped brands make improved sales by simplifying communication challenges. Now, it is has become a commoner for brands to stay competitive in online world. So, technology is never a competitive advantage any longer. Companies now need to stay outperform by reaching to more customers interactively. This requires brands to build websites that work, web applications that meet functional challenges. So, we have extended our service offerings with a practical array of new media service solutions including web application development and other aligned IT service solutions. We study your requirement, the challenge you need to address to outperform and device a thoughtfully unique web application development that would help you make an impressive web presence. We work with skilled team of technocrats, web application developer who work with you to develop standalone applications that help you serve your customers ethically, reducing the time to market while enhancing the product performance. We work with latest technologies including Microsoft Technologies, PHP and its framework such as Magento, Open cart, Virtue mart, WordPress, Joomla, Java and its framework etc., to stay competitive in this evolving eco system. We follow a systemic model to ensure best web development solutions. The process followed mitigates risks of churning out wrongly designed applications. Since requirement gathering to executing suggested ideas to monitoring results and finally ensuring you receive support services, our work model is truly ideal.